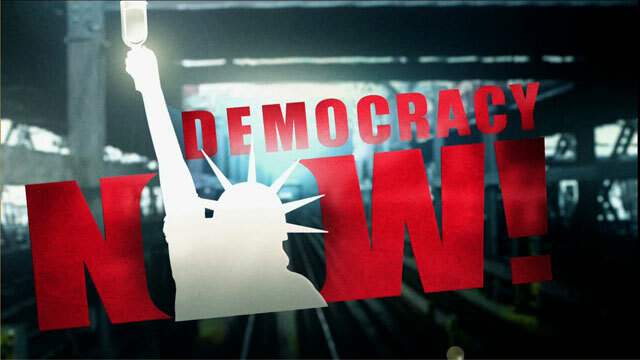 Settlement Reached over Arrest of Amy Goodman, Democracy Now! Producers at 2008 GOP Convention | Democracy Now! NICOLE SALAZAR: Watch out! Watch out! Press! POLICE OFFICER: Get out of here! Move! NICOLE SALAZAR: Where are we supposed to go? Where are we supposed to go? POLICE OFFICER: Get out of here! NICOLE SALAZAR: Dude, I can’t see! Ow! Press! Press! Press! POLICE OFFICER: Get down! Get down on your face! On your face! NICOLE SALAZAR: I’m on my face! POLICE OFFICER: Get down on your face! NICOLE SALAZAR: Ow! Press! Press! AMY GOODMAN: That was Nicole Salazar screaming as the riot police took her down, bloodying her face. As Sharif Abdel Kouddous told the riot police to calm down, they kicked him twice in the chest, threw him against a wall, and arrested him, as well. When I got the call on the convention floor about what had happened, I raced outside to the corner of 7th and Jackson, where the riot police had formed a line, having fully contained the area. I asked to speak with a commanding officer to get Sharif and Nicole released. DENIS MOYNIHAN: Release the accredited journalists! AMY GOODMAN: Where’s the reporters? Sir? POLICE OFFICER: Ma’am, get back to the sidewalk. DENIS MOYNIHAN: Release the accredited journalists now! AMY GOODMAN: Sir, just one second. I was just running from the convention floor. DENIS MOYNIHAN: You are violating my constitutional right. You are violating their constitutional rights. DENIS MOYNIHAN: You are violating constitutional rights, sir. AMY GOODMAN: Sir, I want to talk to your superior. AMY GOODMAN: Do not arrest me! POLICE OFFICER: Hold it right there. You’re under arrest. Stay right there. Back up. Back up. POLICE OFFICER: Everybody, you cross this line, you’ll be under arrest, so don’t do it. AMY GOODMAN: It wasn’t seconds before the riot police ripped me through the police line. As I pleaded with them not to arrest me, the riot police twisted my arms behind my back, handcuffed and arrested me. Later, when I was brought to where Sharif was standing handcuffed and we were loudly demanding to be released, indicating our press credentials, a Secret Service agent came up and ripped our credentials from around our necks. Well, three years later, we have reached a major settlement in the case that includes $100,000 in compensation paid by the St. Paul and Minneapolis Police Departments and the Secret Service. The settlement also includes an agreement by the St. Paul Police Department to implement a training program aimed at educating officers regarding the First Amendment rights of the press and public with respect to police operations, including proper procedures for dealing with the press covering demonstrations. We, along with the Center for Constitutional Rights, the ACLU and the Reporters Committee for Freedom of the Press will have input into the training program. The St. Paul Police Department will use its best efforts to get the Minneapolis Police Department to institute a similar program, and will also make the program available to law enforcement personnel statewide. We will be holding a press conference about the lawsuit today at 1:00 p.m. in Lower Manhattan on the corner of Broadway and Liberty Street, right near the Occupy Wall Street encampment.